Voted 'European Car of The Year 2002' in November 2001. Good four star score in 2001 NCAP crash tests. Mini MPV attributes do not extend to a flat floor with no centre console as in earlier versions of the Honda Civic. Doesn't shift the goalposts set by the Ford Focus. Clap hands wipers leave unwiped section next to screen pillars. Footwell designed for left hand drive. Shocking 4th from Bottom of 100 models for reliability in Auto Express 2002 survey. Petrol models average for breakdowns and faults but poor for problems; diesels average for breakdowns bur poor for problems and faults in 2003 Which survey. 3rd from bottom out of 137 models in 2003 Top Gear survey. 307 3rd bottom model in 2004 JD Power Customer Satisfaction Survey. Clutch failures increasingly common. Came 20th = from bottom in 2005 JD Power/What Car Survey of 23,000 cars reg Sep 2002 to Aug 2003 with satisfaction score of 75.4%. Problems include total power failures, total (Multiplex) electrical failures, moisture in fusebox, trip computer failures, service indicator failures, poor starting, brake pedals falling off, steering column stalk malfunctions, splits in seat covers, rattles, screen leaks, cracked screens, complaints of poor ride quality even on 1.6 and 1.4HDI versions. ECU problem with HDIs causes flat spots and hesitation. A permanent cure seems to be slow in coming through. One Backroomer's list of problems:- "electronic service indicator counting down very very quickly, carpet coming adfift of the trim, exterior door rubbing strips coming adrift of the door, a breakdown whilst driving, steering lock/ignition key recall problem, glovebox release mechanism broken, horn intermittently not working, paint chipping on bonnet despite mainly slow speed driving, hatchback would not close until shut several times, rear seat velour stitching not finished, remote central locking intermittently not working, electronic oil level indicator reading empty despite being virtually full, etc." Fault in indicator stalks very common on 307s from May 2001. Many owners force and break them. Free fix available in France from December 2002, in UK from January 2003 but by 2007 this had been withdrawn. On early 2.0 HDIs, rubber cushioned timing belt pulley needs replacing at same time as timing belt (60k - 70k miles) otherwise can separate. Odometer over-reading problem cured by dealer sofware upload via OBD2 port. Clutch judder can develop on 2001/2002 diesels, caused by wear in internal damper of dual mass flywheel. Needs replacing with modified unit to solve the problem. Dual mass flywheel failure now common on early 2.0HDIs and the flywheels may last only 25,000 miles. Older cars (2001/2002) may suffer water ingess to the ABS ECU and need a new ECU. Problem of 1.6 and 2.0 16v diesels slipping into limp home mode put down to throttle butterflies sticking or their spindles wearing prematurely causing them to stick. The throttle position sensor identifies this and sends a message to the ECU to limit the engine to limp home mode. Alternater belt tensioner bolt can snap off the block. Can develop a minor wiring harness fault that causes the heater fan resistors to fail. End of plastic dipstick of 1.6 HDI engine can break and drop into sump requiring removal of sump to retrieve it. 'Whirring whine' from 1.4HDI may be failing timing belt tensioner, which is a roller bearing device like the idler pulley, but with a reddish rubber/nylon damper. Gates cambelt kits include this part. Wise also to replace waterpump which it driven by the timing belt. 9-5-2012: Important to check the drop-down spare wheel cradle mechanism and the jack enclosed in the spare wheel. Jack and mechanism may need greasing or can corrode and seize up. Also check and correct the pressure of the spare tyre. 16-9-2012: From "the trade" concerning DPFs on 307 diesels: "These are programmed to illuminate the lamp at about 70,000 miles, but it is dependant on how regularly the DPF has required re-gen’s up to that point and how frequently the fuel tank has been topped up. This applies to the 2.0 Hdi RHY & RHZ engines only. Apart from these cars being possibly the most finicky and unreliable creations on this planet as far as it goes with engine and electronic issues, they are a nightmare when it comes to the DPF system, especially if it (thinks) its run low on fluid and the DPF is now full. The additive tank is just in-front of the rear suspension torsion beam strapped to the main diesel tank, so a vehicle lift is essential to even reach it. It is Carcinogenic and requires some ingenuity with hoses and tubes to fill the tank. Don’t forget the new cap (magnet inside) Approx £84 from the dealer for 3litres. 31-12-2012: 'Gong' sound means that car battery is failing to hold sufficient charge and needs to be replaced. 8-6-2015: Explanation of how 206 and 307 diesels can catch fire: A number of owners have reported these vehicles catch fire due to the design and failure of the heat shields on the front exhaust manifold downpipe and turbo. The heat shield is made up of metal and heat proof material and over time and heavy mileage it breaks down and deteriorates due to oil/injector misting or oil leaks which my leak on the matted material and due to high extreme temperatures cause pieces to break off and fall into the alternator and air conditioning pump components and wiring, etc. If this continues to happen the air conditioning and power steering pipe get red hot due to no protection and the PAS pipe could burst. It's not the liquid that ignites, it's the toxic fumes and vapours that catch alight and cause catastrophic damage. 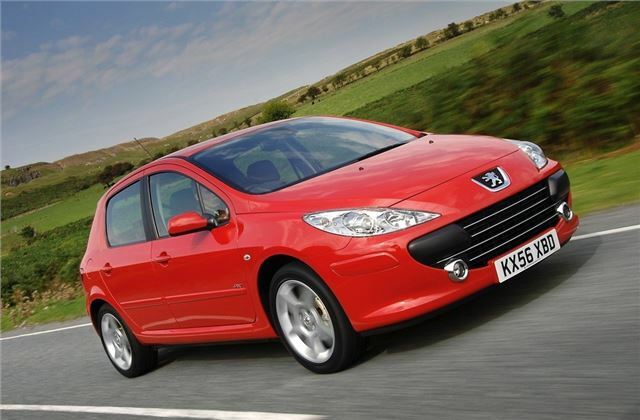 Peugeot has been queried about the design of the two pipes running along the top of the manifold and turbo and changed that design on the newer 207 and 308 models. Some owners have left the shields off but Peugeot says there is a modified heat shield which has metal, material and outer metal coating as leaving it off will cook those pipes. 14-8-2018: Various faults appearing on otherwise reliable 2004 Peugeot 307 2.0HDI SW at 114,000 miles: 'Antipolution System Fault' light appeared accompanied with drop in power (limp mode). This warning is ON randomly and intermittantly during a journey, most often there is no warning. Can be on for part of a journey, next trip it is off. Can do 200 miles with it not on sometimes. Owner's code reader said 'Permanent fault P1445' that translated to 'Purge Flow Sensor circuit. High Input'. Might mean the DOF is filling up with ash and needs chemically cleaning by Ceramex. But Peugeot dealer's diagnostics came up with 'Permanent fault stored with Fuel Cap Presence Sensor'. That might be the sensor or might be a badly fitting fuel cap. Late 2001: TSB issued to check all common-rail to injector unions on HDIs for leaks. 30-4-2002: 28,441 307s recalled because ignition lock could get stiff or seize and this could lead to starter motor burn out. Complete steering lock assembly of affected cars to be replaced. 23-8-2002: 643 307s VIN 82136270 to 82155798 recalled because front shock absorber lower yoke may not be to correct spec and may fracture. Affected cars to be checked for cracks and new parts fitted where necessary. 8-11-2002: 89 307s recalled because filled with wrong brake fluid. Brake and clutch fluid to be replaced. 5-12-2002: 289 307s recalled because front left hand anti-roll bar linkage may contact and chafe on the brake pipe when turning wheels to left full lock. Inspect, reposition and if necessary replace left front brake pipe. 8-1-2003: On automatics the transmission control wiring loom may become pinched making it possible to start the engine while the car is in gear. Check for pinched cable and repair and reposition where necessary. September 2003: Repeat of 2002 ignition switch recall to try to catch cars which escaped because when the switch jams, the starter motor remains engaged and this can lead to a fire. 2-9-2003: on 554 307s may be cuts in sidewall or treads of one or both right hand tyres. Check and replace tyres as necessary. February 2004: 307s not voluntarily taken to dealers for odometer softwear upload will be recalled for it. October 2005: 307 owners received recall notice, "Within the Peugeot quality programme it has been identified that it is necessary to reinforce the sealing of the electrical connection of the power assisted steering system on your vehicle, under certain conditions the repeated entry of salt water into this connection could cause short circuits which, in extreme cases may lead to the start of a fire in the engine compartment."